The Little Gym Birthday Party is a time to relax and enjoy the fully supervised party where you have exclusive use of the whole gym. Our custom designed facility is complimented by our lively and friendly staff. Every party includes plenty of music, movement, games and FUN. We mean it when we say our parties are no fuss; because we do everything from providing the invitations to the clean-up of the party. Children have a blast and parents can sit back and enjoy the special occasion. Each party is led by 2 instructors……your children will have one hour to explore the gym where instructors will facilitate age appropriate games and physical activities. We use our specialist gymnastics equipment (bars, beams and tumble area) as well as our parachute, balls and hoops. After an hour of fun and games we have time for Birthday cake and snacks before children disappear back into the gym for the remainder of the hour and a half. 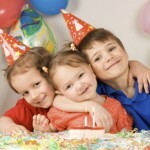 The party is private so your child and birthday guests will have 100% of our attention. We handle all the details ……you just show up with the children. The Little Gym runs parties for children from 1 to 10 years of age. Party slots are available on Saturday and Sunday. Click here for further information or call us now for availability on 01423 701560. Make sure you are organised, some Harrogate Mum’s are booking six months in advance to secure their preferred date!